Mitosis is the step in the cell cycle that the newly duplicated DNA is separated, and two new cells are formed. This process is important in single-celled eukaryotes, as it is the process of asexual reproduction. In multi-celled eukaryotes, mitosis is how a single zygote can become an entire organism. Mitosis has several distinct stages, or phases, that will be discussed below. The other stages in the cell cycle include growth and the replication of DNA, both required for mitosis to take place. Below is a picture of where mitosis fits into the cell cycle. In multi-celled organisms, life always starts as a single cell, formed from two gametes. This zygote carries all the DNA necessary to create a fully functioning organism, but not near enough cells. The purpose of mitosis is to produce more cells. After the first round of mitosis, there are only two cells. These cells both undergo mitosis, and there are 4 cells. Pretty soon, a small, hollow ball of cells is formed, called the blastula. This ball folds in on itself as more and more cells are created. The cells begin to differentiate, which allows them to complete special tasks in the body. Eventually, a fully functioning organism is developed and can be birthed or hatched into the world. In single-celled organisms, the act of mitosis is asexual reproduction. Single-celled organisms use mitosis to reproduce and distribute their DNA. Some single-celled organisms reproduce sexually as well. To reproduce sexually, most organisms undergo another process, meiosis, to properly reduce their DNA and place the DNA in individual cells. These gametes can then meet and one will become fertilized. This fertilized gamete contains two sets of the genome, which in most organisms is necessary for proper development. Some organisms only have a single copy of the DNA. These are known as diploid and haploid organisms, respectively. The second important function of mitosis is that of repair. When an organism gets injured, its cells are damaged. This can be a physical injury like a cut, or damage from environmental sources like the sun. Either way, the damaged cells need replaced. Nearby cells, not sensing their neighbor cells, turn on the pathways that start the process of mitosis. Eventually the multiplying new cells reach each other, and the damage area is covered with new cells. Some organism are able to regenerate entire limbs this way. Lizards, crabs, and many other animals can lose a tail or claw with no fear, as the limb can be regrown through mitosis. Though technically not part of mitosis, Interphase begins and ends mitosis. Interphase is the part of the cell cycle in which the cell grows and duplicates the DNA. After an identical set of DNA is synthesized, the cell enters Mitosis. Prophase is the first stage in mitosis. During prophase, the DNA is condensed. During interphase, when the DNA is replicated, it is in a loose and open form to allow the enzymes to do their work on the DNA and create a new strand. However this chromatin, as it is called, would become tangled and break if the cell tried to move it without condensing it. During prophase, the cell’s machinery packages the DNA around special proteins, called histones, which allow it to condense into very tight packages. These tight packages of DNA can now be moved around with ease. During prophase the centrioles appear, which are centers on each side of the cell that organize microtubules. The microtubules will eventually reach out and grab the chromosomes of DNA. In plants this stage is proceeded by a step that rearranges the cell to put the nucleus in the middle. In most animal cells, the nucleus exists in the center of the cell most of the time. In plants, it is often pushed to one side by large, water-containing vacuoles. This preprophase allows plants to organize their organelles for division. In order for the duplicated chromosomes to be split up, the microtubules have to reach them. In prometaphase, the nuclear envelope surrounding the cells falls apart. This membrane was separating the DNA from the cytosol of the cell. 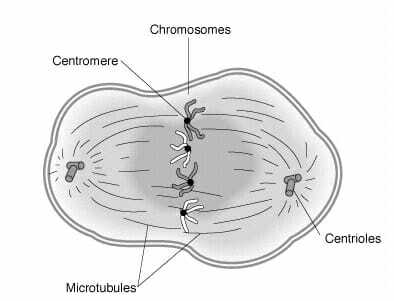 When the nuclear envelope dissolves, the microtubules are allowed to extend from the centromeres to the chromosomes. Each chromosome has a special area known as the centromere, and each centromere has a kinetochore. The microtubules are able to attach to these kinetochores, allowing the cell to move the chromosomes around. Microtubules from each side of the cell will attach to each chromosome during prometaphase. During metaphase, the microtubules start pulling on the chromosomes. Each side pulls with equal force, and the chromosomes end up in the middle of the cell. This area is called the metaphase plate. The cells aligned on the metaphase plate represent two full copies of DNA. Each chromosome lines up next to its sister chromatid, or cloned DNA strand. In this way, when the microtubules pull the chromosomes apart, each cell gets an entire functioning genome. Below is a picture of a cell in metaphase. The sister chromatids, identical clones of the same part of DNA, are bound together at their centromeres. During anaphase of mitosis, the proteins that connect these chromatids are destroyed. Each now its own chromosome, the identical halves can be pulled to each cell. In the above picture, there are two white chromosomes and two grey chromosomes. During anaphase the proteins between the two sister chromatids in each chromosome would dissolve. In the above cell this would lead to 8 total chromosomes after the chromatids separate. In the next phase, they will be separated, to create 4 chromosomes in each cell, the number the cell had before it duplicated its DNA. The final phase of Mitosis, telophase, occurs when the chromosomes are pulled toward each centriole, and a cleavage furrow forms in the cell. The chromosomes will eventually get a nuclear envelope formed around them, and become their own cells. The centrioles will dissolve, and each cell will resume normal functioning. One crucial last step, cytokinesis, is needed before the cell function. This last process is not a step of mitosis, but rather the beginning of Interphase. Once divided, the cells can resume growing. Cell Cycle – In eukaryotes, the cycle consists of Interphase and Mitosis, with some cells going into a non-diving third state. Cytoplasm – The fluid surrounding the DNA in cells. Microtubules – Small structures in the cytoplasm of cells made from proteins, which allow the cell to move various organelles and chromosomes. Binary Fission – The process of cell division in prokaryote, which differs do to the lack of organelles and associated membranes. 1. A cell duplicates its DNA, divides into two cells, then divides into two cells again. Effectively, the cell reduces its DNA in half. Did this cell go through mitosis? A. Yes, but only once. C is correct. This process, although it starts like mitosis, is something completely different. This is known as meiosis, and is covered in a separate article. During mitosis, the DNA is maintained exactly, from parent to daughter cells. In meiosis, the number of alleles per gene is reduced, allowing gametes to form and create an organism with only two alleles per gene. Mitosis aims to create identical cells at the end of the process, needed for asexual reproduction and developing new organisms. 2. During mitosis, the chromosomes have condensed, lined up on the metaphase plate, and the chromatids are being separated by an enzyme? Which phase of mitosis is this? C is correct. When the chromatids are being separated, the cell is in anaphase of mitosis. After they are separated, the cell enters telophase. Also in anaphase, the chromosomes become extremely condensed. This allows them to fit into a newly formed nucleus in the new cell. 3. Yeast, the asexually reproducing organism used to create alcohol, eats sugar to create energy and reproduce. To make beer or wine, yeast is placed in sugar water of different flavors, and the yeast go to work creating alcohol. Typically, large amounts of yeast are added to the sugar water. However, if only a few yeast are added, the mixture will still produce the same amount of alcohol and deplete the sugar, in a similar amount of time. What process allows this? B is correct. Yeast actively reproduce in a sugar rich environment, because of the large amount of resources available. While the lack of oxygen is what makes them produce alcohol, the yeast can still reproduce while making energy from sugar fermentation. Therefore, through mitosis, just a few yeast can turn into millions of cells, in a short time.